Something to think about – eh? 🌸 beautiful flower, Jodi!! Happy and serene Sunday to you, my friend. Something to think about – eh Robin! Made me kinda wonder. 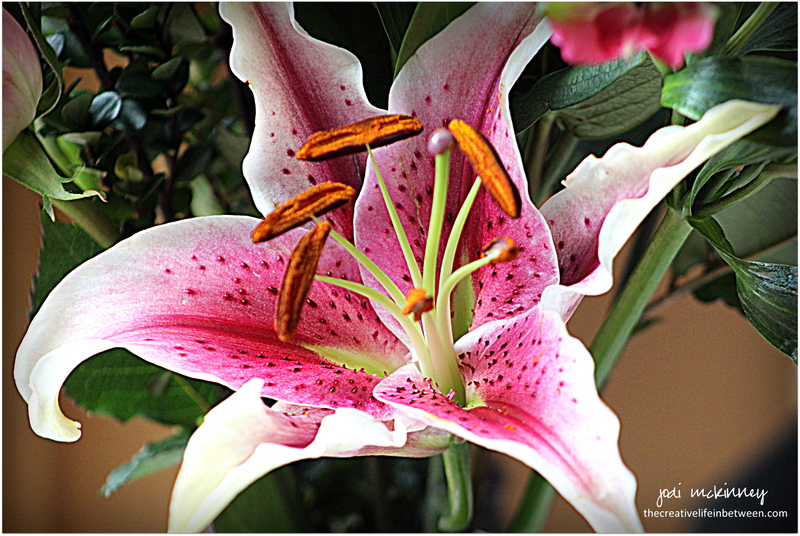 And isn’t the stargazer lily a beaut!? There were a couple in my anniversary bouquet from hubby. They smell as lovely as they look too. A fave of mine. Beautiful flower!! Star gazer lily! I think we stare at the stars because we are dreamy! And yes, they do stare at us! I love the stars! Have a wonderful Sunday! I like that pj! Happy Sunday! awh! how sweet you had them in your wedding bouquet!!! I just love looking at the stars on a clear dark night and the moon absolutely fascinates me… A beautiful image of your Lily Jodi! Thanks Evelyn! I know – right – looks like a full moon tonight! and it is so warm and beautiful here! What a wonderful snippet to think about! Your bouquet must be lovely with that lily in it. I know – right? I really really wonder…. You always have a clever response! Twinkle to you Jill! I have recently discovered how much I love it. Maybe it’s just my eyes, but I had to look at that flower a long time before I decided for sure that it was a photo, and not a painting. Which is really kind of cool!